ABOUT US: Excalibur Racing is a non-profit, boat racing organization dedicated to the sport of international professional outboard hydroplane racing. We are members of the Columbia Outboard Racing Association (CORA), Seattle Outboard Association (SOA), and former members of the American Power Boat Association (APBA). Other local and national boat racing clubs and associations we are associated with are the State Line Outboard Racing Association (SLORA) and the United States Title Series (USTS). TEAM HISTORY: Our team has successfully raced stock, modified, and Professional Racing Outboard (PRO) hydroplane classes since 1993. 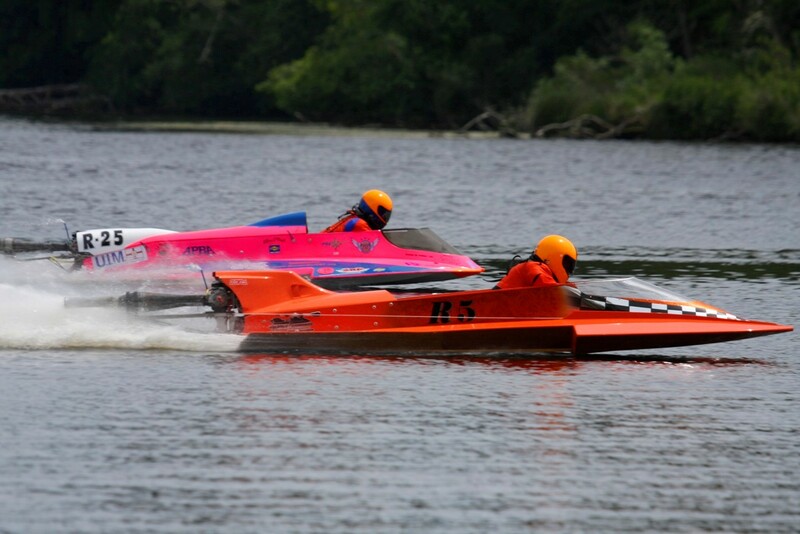 Both Al and Bonnie have raced in the C-Stock hydroplane class at APBA-sanctioned races. Al is a lifetime member of the Seattle Outboard Association. 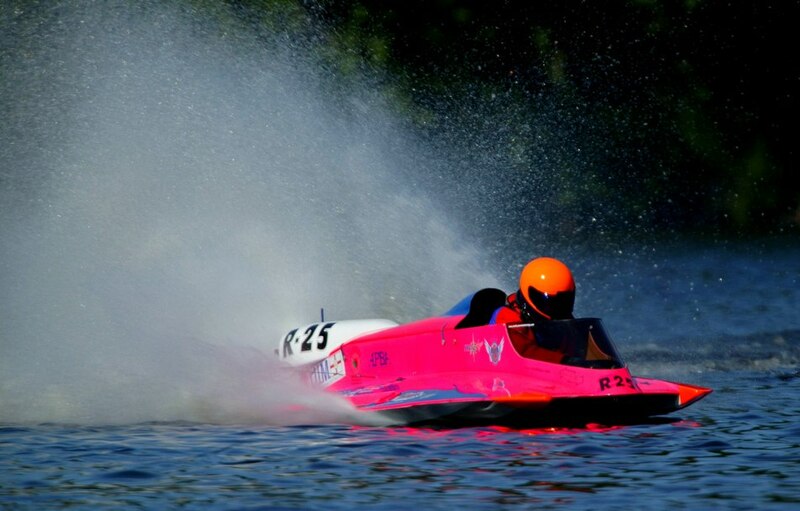 Our team has attended five APBA PRO National Title races in Depue, Illinois, since 1995. We have raced in APBA Region 10 for 22 racing seasons. 2013 O-125 Cullaby Lake Race Photos: The first APBA race sanction we participated in during the 2013 season was at Lake Cullaby near Seaside, Oregon. The pictures shown below are from the first race for the Rossi GRM 125cc motor setup on the modified Karelsen hydroplane which I have named "Project 125". The Karelsen hull was designed for 250cc motor applications. I stuck the motor (melted a piston) by running too lean and over-heating the new motor during the second heat. 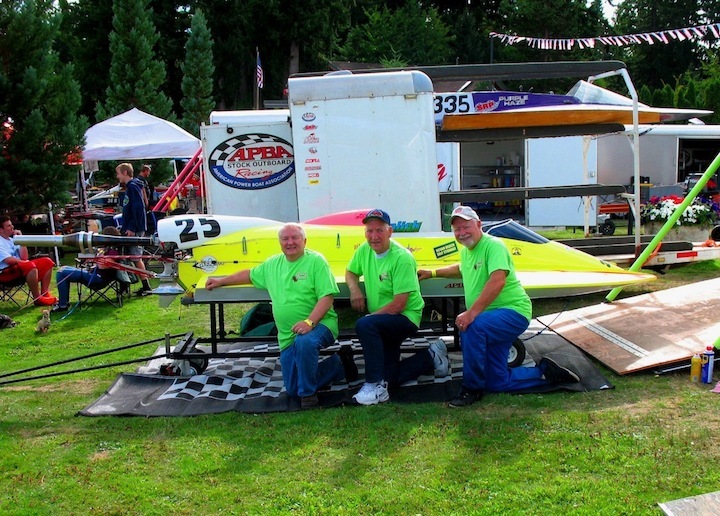 The motor was quickly repaired and run at the Silver Lake, Eatonville, WA race in 2013. I consistently had fuel pressure feed problems with the little PRO motor. 2014 Racing Season: In 2014, at Lake Cullaby, Oregon, we attended the Roy Blackwell Memorial Regatta. We competed in the APBA 350ccH Class Western Divisional Race with our Italian Rossi GRM 250cc motor. We won 2nd Place at this APBA Western Divisionals Race on Saturday, June 21, 2014. Sunday, during the first regular race heat in 350 PRO hydro, I had an expansion pipe control equipment linkage failure (broken pipe position stop wire and bent pipes connector rod), but nothing really serious to fix after the boat racing weekend. The summer weather was perfect and the oval course was really fun to drive. There were 176 entries on Saturday alone. 43 heats were run in one day (many of them APBA Western Divisional Class races) -- non-stop boat racing action from 10:00 AM to 6:00 PM! Woo Hoo! Our team also took 2nd Place in the 350ccH PRO Class at Silver Lake in Everett, WA, on June 7, 2014. This was our team's first racing opportunity of the APBA 2014 Region 10 boat racing season. We did really well against Region 10 competitors equipped with 350cc Professional Racing Outboard (PRO) motors that are 100 cubic centimeters (cc's) larger than our Italian PRO motor. All PRO hydros run methanol race fuel and have similar carburetor sizes and types on the highly specialized two-cycle boat racing outboard motors. We don't race at Newberg, Oregon, any more due to the narrow, odd-shaped race course and frequent debris in the river (we only have one $1,300 gear case for local races.) It is still a great place to go and watch boat racing on the Willamette River. We were not able to race at Silver Lake, Castle Rock, WA, in 2014. The race was called off because of high wind conditions for both Saturday and Sunday on the boat race course. The Karelsen PRO hydro's new direct steering hardware did test well during the Friday testing session as the wind wasn't a factor that day. Boat racers call cancelled race days due to high winds "Blown Off" days in boat racing lingo. It was also a significant revenue loss of the first major local race of the season for the hosting boat racing club. The last three races of the 2014 season were not very productive for our team. Both motors did not perform well at Silver Lake, Eatonville, and Lake Spanaway. Lee and I rebuilt the 125cc motor and it ran well in testing on Friday at Lake Lawrence. However, I hurt my lower back some way on Friday testing at Lake Lawrence and we had to pack up our race trailer by the end of the testing day. I sold the complete 125cc motor setup to another Region 10 racer after the Lake Lawrence Regatta. 2015 Racing Season Photo - We planned to only run the Rossi 250cc motor in 2015. The GRM 250cc motor sustained significant piston and cylinder wall damage when we had an exhaust pipe come loose at the end of the 2014 Cullaby Lake. When the hydroplane came off plane the motor sucked in some broken pipe control hardware scrapnel into the #2 cylinder chamber. The damage happened at the end of the Lake Cullaby second heat on Sunday. As a consequence of this significant motor damage event and the total motor overhaul required, we only raced one heat in 2015 at Lake Lawrence in Yelm, Washington. The entire 250cc motor was refurbished after we discovered the crankshaft web also needed to be replaced by a machine shop in the mid-west. The #2 cylinder wall was professionally recoated with a Nikosil process. The motor ran extremely well at Lawrence, but I did have a loose steering problem on the last lap of the first heat. Below is a Team Excalibur photo taken at the race pits on Testing Friday. The bright green shirts we are wearing are a donation from Kelly's Brighton Bay Oregon Marina (they have the best fresh-cooked crab, oysters, and beer on the West Coast!) A copy of the photo below was also presented to Kelly's wife at Kelly's Resort in 2017. Theron, Marv, and Al in front of Excalibur II on Tesing Day in September, 2015. A photo of a best friends' PRO race crew in the hot pits. The rebuilt motor ran extemely well on Saturday. I had my heart attack in the pits after the first heat. -- lucky for me the EMT's were close to us in the hot pits. The photo above was taken with my camera by another racer pitted next to us during the Lake Lawrence Regatta weekend. 2016 Kalama Car Show Exhibit: The Kalama Car Show is put on annually by a local custom cars club from Longview, Washington. 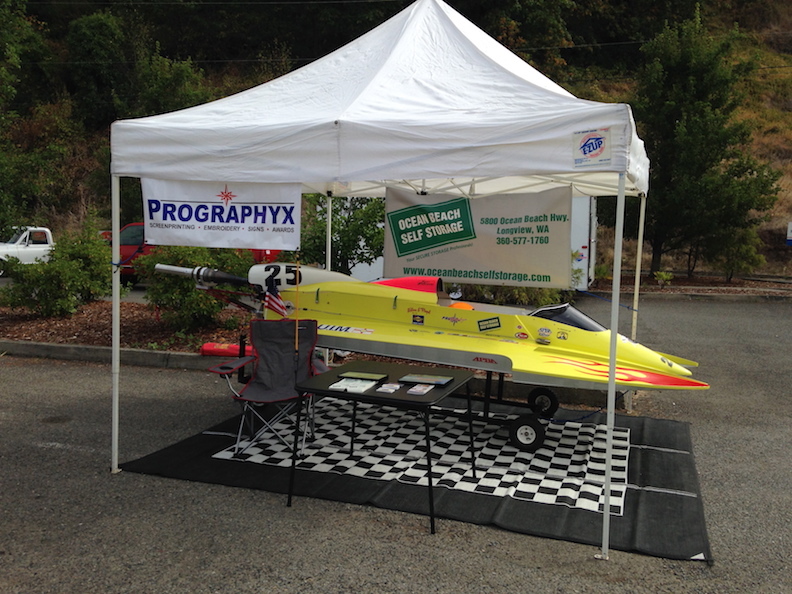 I entered my hydroplanes at this car show event over the years to promote my racing sponsors and introduce attendees to APBA and UIM Professional Racing Outboard (PRO) equipmment technologies and classes. We hand out literature on outboard racing and sponsor advertising brochures. It is a fun event to attend and participate in this event as an exhibitor, even though it was not a custom car we are presenting to the public. Both the Mostes and Karelsen hydroplane setups have been exhibited at this event in years past. We did not exhibit the racing setup at the car show in 2017 because we were out of town that week on a road trip. 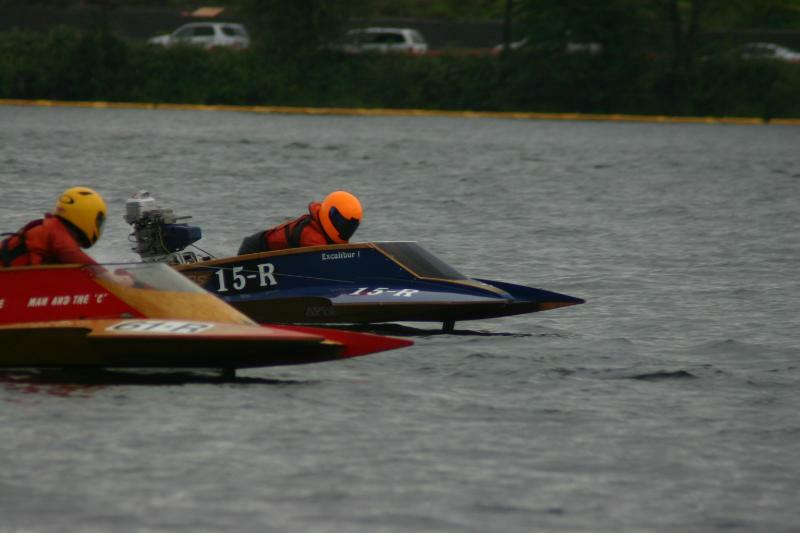 O-250 Mostes Racing History: Our first 250/350ccH PRO class race for the 2011 season in APBA Region 10 was at Silver Lake, Everett, on June 4th. The weather was perfect and the O-250 Mostes ran well on the unique, triangular-pattern boat race course. Unfortunately, the other 250cc hydroplane owner who showed up early at the race site withdrew his entry just before the race, so I ran with three 350cc PRO hydroplanes entered in the event. We also showed the O-250 Mostes with our ProGraphyx sponsor at the 2011 Cowlitz County Business Expo hosted by the Cowlitz County Chambers of Commerce at the Cowlitz County Expo Center in Longview, WA, on February 25, 2011. The hydro was a big hit at the show and drew lots of visitors to the ProGraphyx booth (see picture below.) The Mostes technology is being applied to our Karelsen hydro setups and has become the reference design for several new and successful US boat builder-designed composite hulls. PRO Class Hydroplanes We Have Owned & Raced: Excalibur I (our OSY-400/C-Stock racing class hydro) was sold to a California boat racer in 2008. Excalibur II has been modified to Union Internationale Motonautique (UIM) hull construction safety standards for the O-125 class of hydroplane racing. Excalibur III was purchased in Florida after the 2008 UIM/APBA F-250 World's Cup from the Italian Cremona Racing Team. Excalibur III is an Italian Mostes hull powered by an Italian Rossi GRM 250cc (opposed twin cylinder) outboard racing motor. Ed Karelsen and his son built Excalibur II in Seattle with aircraft quality composite materials. Excalibur II has run a Japanese Yamato 250cc racing motor in the past; it is now be equipped with a Rossi GRM 125cc (single cylinder) or optional GRM 250cc (two cylinder) outboard racing motor. The Excalibur III Mostes hydro was sold to Mike Schmidt Racing in December, 2011, and is back in Region 10 with a fourth US owner. Racing Equipment Descriptions: PRO racing motors have one adjustable expansion pipe per cylinder (two pipes that are linked by a bar for the 250cc motors) that is controlled by a foot pedal (like in our hydro) or hand lever near the throttle. The straight exhaust pipe is spring-loaded to return to the normal driving position (in or out, depending on the driver's preference and the type of race start.) I prefer to "pull the pipes" for acceleration and milling before a APBA-style clock start. UIM-style exhaust pipes have aluminum muffler tips installed at the end of the pipes for quieter running. Both Rossi racing motors share many spare parts; the bore size is the same for the cylinders, they share the same carburetor models and fuel feed requirements, and the ignition types are identical. FUEL & OIL: The PRO GRM motors that we run for our 250cc and 125cc class setups burn racing grade methanol fuel and Red Line synthetic racing oil. The Red Line synthetic oil formula is similar to castor oil except that it burns cleaner and leaves less residual film after racing. The special 2-cycle oil is combined with the methanol fuel in a 20:1 fuel ratio mixture. Excalibur Racing was selected by Red Line to test a new formula with less detergents added to the oil in 2006. The new formula has now replaced the original Red Line 2-cycle racing oil used in methanol-fueled go-kart, powerboat, motorcycle, and drag racing. We use Marvel Mystery Oil to fog down our motors after each day of racing. Special thanks also go out from us to Wilcox & Flegel in Longview, WA, for our 2010-15 seasons' supply of methanol race fuel. We also wish to thank Al Book Custom Welding in Burien, WA, for supplying our custom fuel cell in the O-250 Mostes hydro and a new fuel cell for the O-125/O-250 Karelsen hydro setup. Lee Teitze of Machined Components modified our motor towers and pipe racks to accept both Rossi powerheads for quick changeouts during the 2103 season. I finally just bought a second sepecialized tower for the 125cc motor setup from Lee. Thank you Lee, and your generous family & friends crew, for sharing your special boat racing talents and precious time in keeping the 125cc motor running during the initial testing session and the 2013 race season. I wish I could have made it work better, but the Karelsen and possibly the race boat driver were the wrong tools for the O-125 task. Thank you also for the many late night rebuild hours that you spent on assembling two highly competitive 250cc motors for me (the Yamato and the Rossi). Boat racing would not have been as successful and fun without your shared knowledge, expert machinist skills, innovative design ideas, and hydroplane racng instruction sessions over the many years we raced together. God bless you, my good friend! 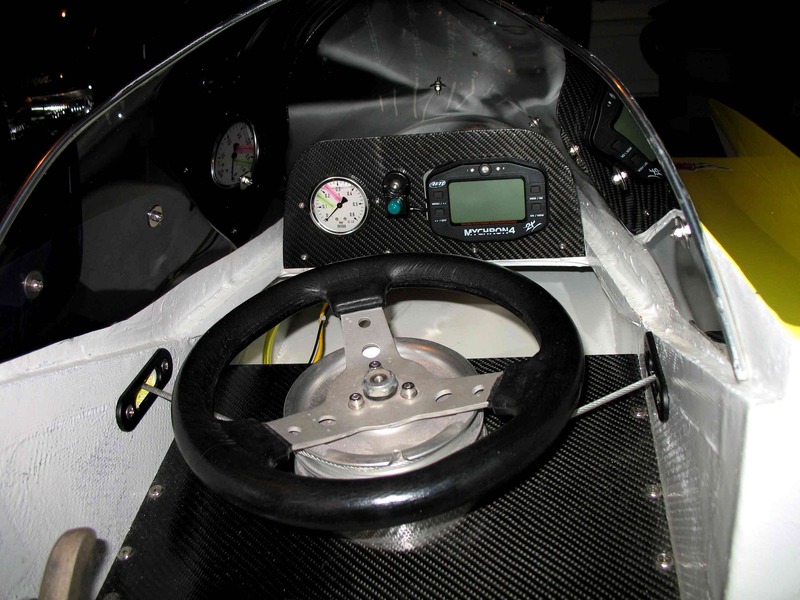 DRIVING POSITION & PERSONAL SAFETY EQUIPMENT: Our PRO hydros are driven in the prone (laydown) position within the narrow cockpit confines of the light weight, three-point design hull. The combined equipped hull, motor, and fuel weight is just slightly heavier than the outfitted weight of a male adult driver (including his safety clothing & gear.) Drivers wear a cut-resistant racing suit made of Kevlar or Dyeema ballistic-protection fabric, a custom-made racing life vest equipped with composite flak panels (inserted in chest side and back pocket cavities) and leg and helmet safety straps, a Snell-rated full-face helmet with safety strap connection loops, closed-toe driving boots, and water sport gloves (for a sure grip on the hand throttle and go-kart style steering wheel.) Again, we extend a special thanks to Security Racing Products in Issaquah, WA, for supplying Al with new custom racing suit and life jacket safety gear with very reasonable prices, custom fitting, and high quality craftsmanship. Driver & crew safety are always a priority in all motorsports. We raced the UIM-retrofitted Karelsen hydroplane four times in 2013, six times during 2014, and once in 2015. Race Conuct & Hydroplane Weight Limits: APBA PRO classes run on a closed oval race course with a clock-controlled flying start. European UIM O-250 and O-125 hydroplane races are conducted on oval and traingular-shaped courses with a modified LeMans start and they usually require more laps to complete than US APBA or AOF races. APBA and AOF clubs race on fresh water rivers and lakes throughout the United States. The Depue Mens Club and US Title Series organizations normally host the APBA PRO Nationals in Depue, Illinois, each year. US national championships are awarded for championship race finishes 1st through 3rd place. APBA also acknowledges and awards boat racers with most earned national competition points for a specified number of competition races in each PRO hydroplane or runabout class. 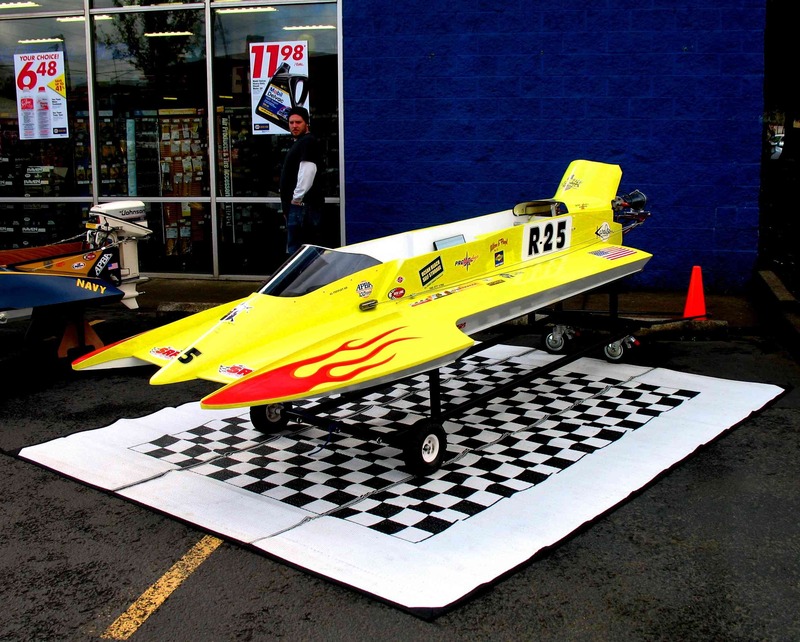 There are no weight limits for APBA PRO Class 125cc or 250cc hydroplanes. However, UIM does have minimum weight limits for O-125 and O-250 hydroplane classes as indicated in the table below (ref. : pages 308-314 of the 2011-13 Circuit Rules posted on the UIM official website). Note*: Minimum weight is a complete [racing boat] rig with driver weighed ashore directly after a race without residual water but with residual fuel. "Last Dance" Notice in 2017: Oregon Race Rescue's Steve Erb and his ARR Team decided to retire from their water rescue service at the end of the 2016 season. The custom-made water rescue boat that they operated was second to none, and they were equipped with the best equipment for the many unique water recovery and accident trauma stabilization tasks at hand. Their specialized rescue and medical response crew of certified divers did an outstanding job. They provided top notch professional race water rescue services at our local boat races for about 30 years. You can read Steve's parting letter to the outboard racing community on CORA's (columbiaracingassociation.org) website. Steve and his crew pulled me out of the water after crashing more than once. Thank you Erb's and professional rescue team members for your dedicated service to the sport of outboard racing in the Pacific Northwest for three decades. What I learned after the 2013 Season: The new 125cc motor setup was running very lean on fuel. We tested at Silver Lake, Castle Rock, with two different types of carburetors (Dellorto and Mikuni) with the same results in June before the first race. I melted a piston pulling the pipe in the back stretch at Cullaby Lake during the first race of the season. We rebuilt the 125cc motor and ran it again at Silver Lake, Eatonville, on Saturday. We had fuel system, steering, and carburetor problems, but finished both heats with legal starts and placed fourth overall (based on the last heat's performance.) We ran the 250cc Rossi motor for the first time on the Karelsen hydro at Lake Lawrence in 2013. The O-250 motor ran well achieving rpm levels over 13,500 rpm. I was disappointed in my direct steering setup and changed the setup to include a steering damper, smaller steering drum, and a line tension turnbuckle like they use on the Trombetta hydro hulls in Europe. The Karelsen hull got better lift with the 250cc motor than the Project 125 setup. Even though the Karelsen is very light weight, it was actually designed with less aerodynamic lift to run the larger 250cc PRO motors. I sold the 125cc motor setup and spare parts to a local racer. As planned, the direct steering system was improved in November, 2013, by installing a new 3-inch steering drum that replaced the 5-inch drum used at Lake Lawrence. A new Mercedes Benz steering damper unit and a stainless steel turnbuckle were also installed on the port side steering cable to reduce loosening of the direct steering system at high speeds and rough water conditions. A plastic containment tray and HAZMAT pad for fuel spills and potential tank leaks was added to the rear floor area. The aft bulkhead was modified to accomodate the new fuel tank tray and pad. I did not find a HUD system that meets my driver helmet integration and human engineering criteria. I think the technology is still some years away from being a viable fielded technology in outboard boat racing. Supporting the 2013 KILO Records Special Event: Scroll down to see the 2013 Devils Lake Kilos photographs taken at the Devils Lake State Park boat ramp (special event pits location). This was the last racing event for APBA Region in 2013. The Sunday runs were cancelled ("blown off" due to high winds) on Sunday. The pictures below were taken on Saturday. Devils Lake is a perfect place for these time trial events. 2013 Kilo Runs Overview - The Karelsen hydro needed serious steering system modifications after the 2013 Lake Lawrence race, so I elected to help several of my PRO boat racing friends by crewing for them during the CORA/APBA kilo and quarter-mile record runs at Devils Lake, Oregon. Devils Lake is located next to Lincoln City on the Oregon coast. Lee Tietze and Jim Ramsay both ran their new 350cc PRO hydros at this Region 10 Special Event. The water was bright green color with a major algae bloom, so the hydro roostertails were often colored shades of green and white. The Saturday weather was perfect (sunny, dry, and no significant wind.) Jim set a regional quarter-mile record for 350ccH. Both Lee and Jim achieved average record run speeds at over 100 miles per hour. Jim set a quarter-mile record with one run clocked at 103.8 mph with about 80 percent throttle in his new Trombetta and Rossi 350cc motor setup. Jim's motor was assembled and tested in Italy by the "GRM Master" himself, Mr. Giuseppi Rossi. It was the third time Jim operated his new Trombetta since he received it from Italy in the late summer. Lee was running his new Darneille hydro with a VRP 350cc motor. I have posted a few pictures here from the 2013 kilo records event to give you an idea of what classes and types of boats participate in this unique world's record attempt event each fall. I'm wearing a bright blue Excalibur Racing T-shirt, tan Red Line baseball cap, and light brown chest waders in the photographs. This was a really fun day topped off with an outstanding Salmon barbeque and sunset at day's end; great friends & great racing competition make this sport very rewarding whether we drive or crew for each other. There were many 1/4-mile and kilo records set during the Devil's Lake 2015 speed record runs, even though there was a "blow-off" due to high wind conditions on both Saturday and Sunday. Diversity at Kilos - Jason Williams prepares to board his record-making D-Mod hydro with Jerry Hopp's Grand National hydro at the dock. My Favorite Picture of the APBA 2011 Racing Season & Special AOF Awards: I placed third in the 250ccH heats at Cullaby in 2011. I would have placed second if I had not "jumped the [starting] gun" by 2 seconds (missed the clock start) at the start line in the second heat. My favorite competition photograph from any race at Lake Cullaby that I have participated in during my 22-year boat racing career is shown below. We also attended the American Outboard Federation's Trout Creek Race in western Montana with State Line Outboard Racing Association (SLORA) in 2011. The O-250 Mostes hydro received the "Peoples Choice" award at the event's hydroplane static display boat show. We placed second on Saturday (at the AOF Divisionals race) and first on Sunday (SLORA race) in the "350 PRO Hydro" class at Trout Creek. 2011 was the last year we raced the Mostes. We sold the setup that winter to the Schmidt's. Al (R-25) and Doug (R-5) battle for second place on Sunday in the Marc Moberly Memorial Race at Lake Cullaby. A lifetime dream of PRO hydroplane race driving come true! The O-350 UIM class World Cup Championship and the F-350 circuit sanctions are fun to watch. 350cc hydro class has been the most popular PRO class in the Pacific Northwest. 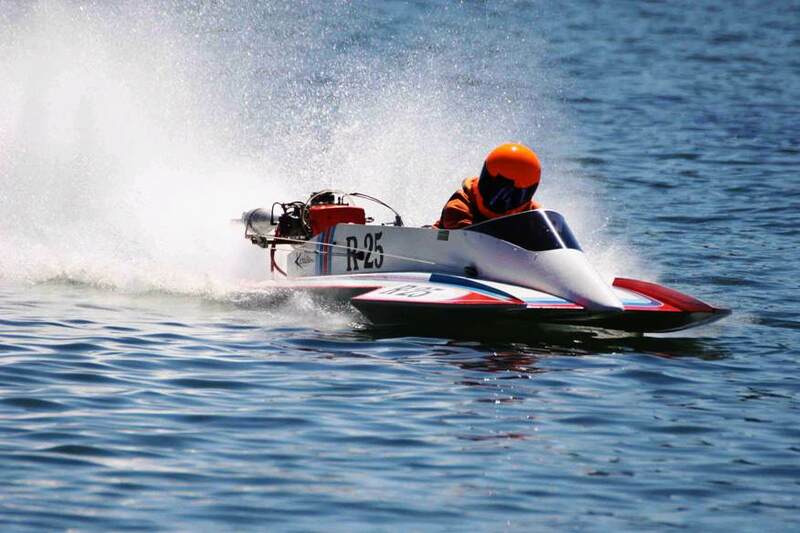 Mike Schmidt's MSR Racing Team from Connecticut ran a 350cc motor on our Mostes hydro - we sold it to him in December, 2011, before the USTS/APBA 2012 PRO hydro season started. Mike said the Mostes is the best turning hydroplane he has ever driven. The Schmidt family produced new composite hull hydroplanes from a mold taken from the bottom of the wooden Mostes hull with a few modifications. The Schmidt hulls performed exceptionally well in Europe and here in the US APBA/USTS PRO circuits. As I said previously, the O-250 Mostes hull is back in the Pacific Northwest. It now has had five owners (i was the second owner.) The "old girl" is starting to show some wear, but is still "race worthy" with a few updates. IN MEMORIUM: A fellow boat racer, Roy Blackwell, lost his battle with cancer in June, 2011. Roy was a true gentleman, a loving dad and grandfather, a great competitor, a devoted husband, and a very good friend to many of us in the racing community. His warm smile, friendly attitude, honesty, ingenuity, and wisdom will be truly missed; he was a great role model to many of us. RIP Roy! See you on the other side, my friend. The 2014 Cullaby Lake Race was named the Roy Blackwell Memorial Regatta to honor Roy's dedication and sportsmanship in APBA racing. More Boat Racing Pictures: The pictures shown below were taken during the 2005-08 boat racing seasons. (Sorry, I could not get the hotlink function to work on this website page so you must copy the address above and paste it into your browser.